Off the coast of Chile, fishermen face competition from a cunning carnivorous hunter that has decimated their industry due to its voracious appetite. Part of the wider seal family that was once hunted mercilessly all over the world, leaving some populations close to extinction, the South American sea lion in Chile has been protected for the last 28 years. Hunting them for their richly prized fur is illegal. Liberated from their most dangerous predator—they are still prey for sharks and orcas—the sea mammal’s population has been on the rise, helped in no small part by the abundant fodder they manage to steal from fisherman. They have learnt to distinguish the sound of the fishing boats’ motors, allowing them to follow the vessels as they head out to sea. “The sea lions don’t hunt anymore. They hear the noise of a boat and they know that the food is there,” said Rojas. With their sharp teeth and the enormous power in bodies that can weigh around 650 pounds (300 kilograms), they manage to destroy the fishing nets and gobble up the treats inside. And they have some appetite, consuming 90 pounds of fish each a day. Rojas says more than 80 percent of the boats working in his area, around the port of Valparaiso, return from a day’s work empty, with their nets shredded. There, sea lions hang around on the beach or beneath the wharf, waiting for the scraps and entrails thrown back into the water by fishermen. Around 40 percent of the world’s sea lion population, some 200,000 animals, live off the coast of Chile and pose a serious threat to the fishing industry. Local fishermen want to be able to cull their numbers. A decade ago, at the Portales cove at Valparaiso, where Rojas is the fishermen’s leader, around 1,300 pounds of fish were caught daily, but that is now down to just 110 pounds. It’s a similar situation all along the coast. “We’re going through a crisis specifically because of sea lions, but we also have fishing quotas. People are desperate,” said Jose Alvarado, leader of the fishermen at Hualaihue, around 700 miles (1,000 kilometers) to the south of the capital Santiago. 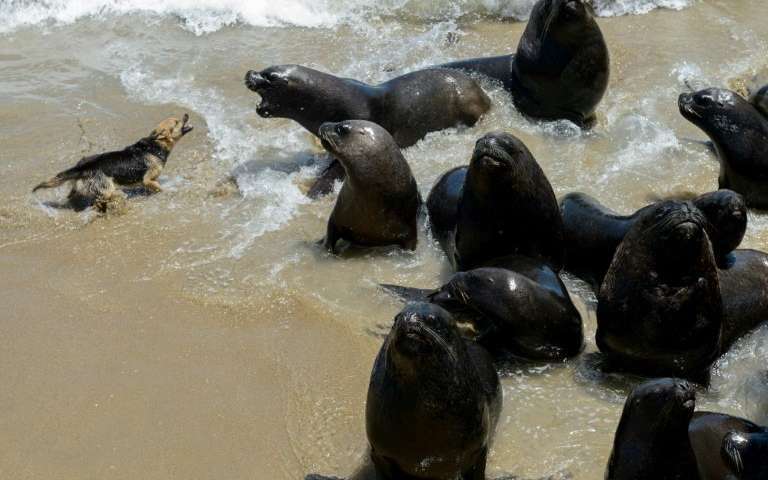 Fishermen want the ban on sea lion hunting lifted so they can control the numbers. “The only viable solution for the fishermen is to eliminate the sea lions and this won’t happen,” fisheries under-secretary Eduardo Riquelme told AFP. He admits that sea lions are creating problems for the fishing industry but the first step in addressing the issue will come in February with a census to establish the size of the Chilean population of these eared seals. The government has also agreed with fishermen to convene a commission of experts to study the problem, while also eradicating some of the fishermen’s bad habits, such as throwing fish entrails, which sea lions feed on, back into the sea. They’ve agreed to begin tests on boats fitted with ultrasound equipment to scare away sea lions, and machines that will reel in nets quicker. The hunting ban was imposed to preserve the South American sea lion, after two closely related fur seal species were almost driven extinct during the 20th century. Chile has signed international accords to protect the sea lion and any violation would engender serious penalties, such as the suspension of salmon imports from the United States, an industry that generates almost $4 billion a year. The predator’s presence is necessary “to balance food chains,” Jose Luis Brito, director at San Antonio’s natural history museum, told AFP. Hunting by humans “can produce catastrophic problems with huge consequences, because they are the ones that control life,” said Brito.